When We Ruled is by far the best general work on the ancient and medieval history of Black people there has ever been. The original landmark publication, superbly illustrated with high quality photographs, maps and drawings, provides an extraordinary and cutting-edge synthesis of the archaeological data, the documentary evidence, and the historical linguistic research. It recounts the fascinating story of the origin and development of indigenous civilisations across the vast panorama of the African continent. In 2008 ‘Before The Slave Trade’, a highly pictorial companion volume to When We Ruled was published, This new book combines both. In the augmented 2nd Edition the author answers the key question in Black history: How much documented history is there beyond the Slave Trade, Mary Seacole, and Malcolm X? In 818 pages that question is answered again and again with a vast array of evidence that explodes the widely held view that Africans were without historical distinctions. In particular, there are ancient and medieval monuments that are still standing all over Africa. In addition, there are Black families and institutions that still possess their medieval manuscripts. The history of Black people cannot be divorced from the history of peoples on other continents particularly Asia, Europe, and the Americas. Topic areas that have traditionally been ignored, such as Black Women’s history, early African science and technology, and the two-way influences between Africa and Europe, are also discussed. What is remarkable about this work is that for the first time it dares to connect Egypt, and its cultural affinities, with Africa and its chronological timeline within the vast chronology (nearly 90,000 years) of African achievement. It is now untenable for Egyptologists to consider themselves to be experts on Egypt without understanding the African cultural signature embedded within Ancient Egypt and its long history. Faculty, students and parents interested in a comprehensive, critical and balanced overview of African or Black history will find no better book. 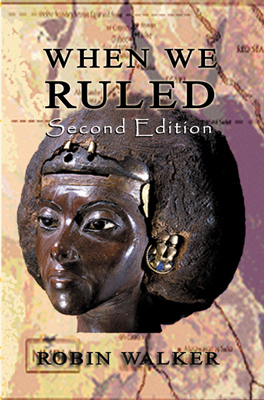 When We Ruled – Second Edition by Robin Walker. Afterword by Fari Supiya. Reklaw Education Ltd, London, 2013. 818 pages: *9 colour photographs, *237 monochrome photographs, watercolours and etchings, *19 maps, *King List, *2 Tables, *Chronology, *Index, *Bibliography. Paperback RRP £40.00. ISBN: 099310200X. When We Ruled by Robin Walker. Afterword by Fari Supiya. Every Generation Media, London, 2006. 713 pages: *61 colour photographs, *9 monochrome photographs, *30 watercolours and etchings, *18 maps, *King List, *2 Tables, *Chronology, *Index, *Bibliography. © 2014 Recklaw Education Ltd.